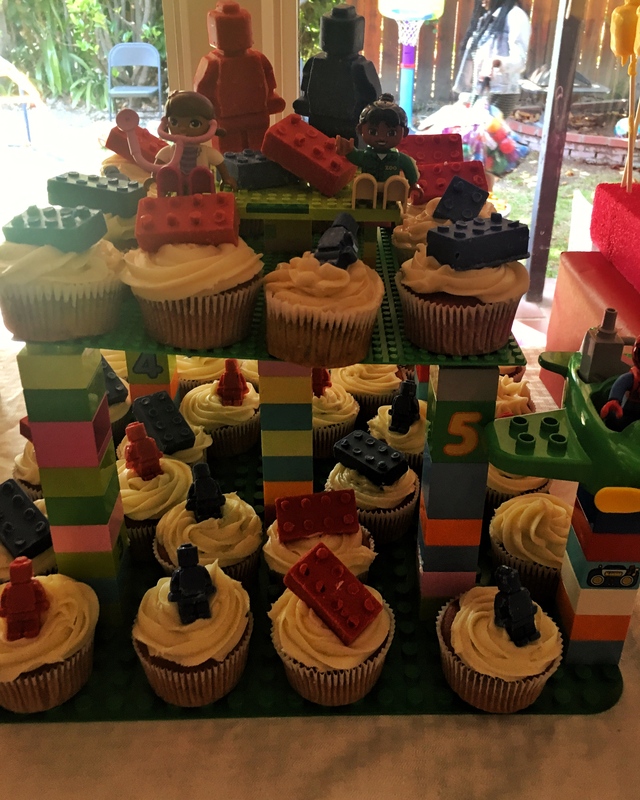 For my twin boys 3rd Birthday, we had a LEGO Party. I wanted a theme that was colorful and represented something they both enjoy. 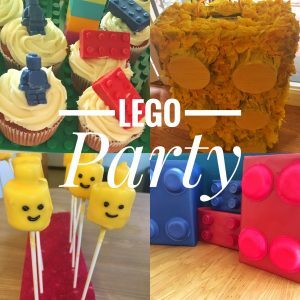 I took to Pinterest to create my board of different LEGO party ideas. 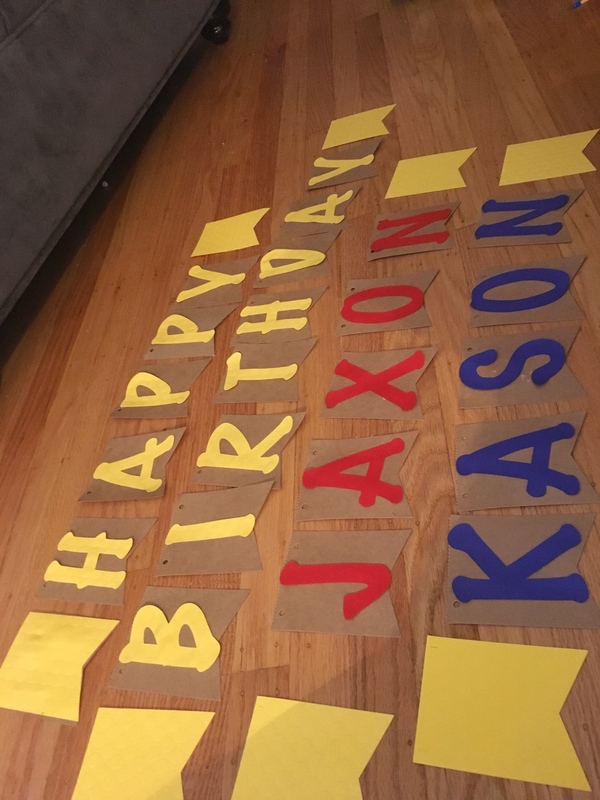 With the boys only being 3, I didn’t want to spend a lot of money on decorating the LEGO party. 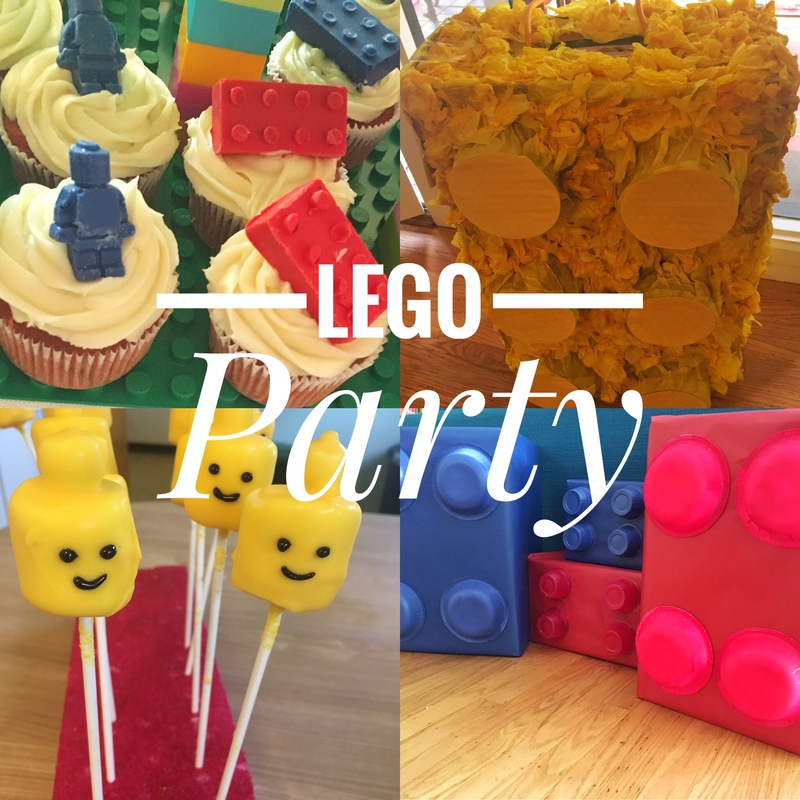 Using a lot of items that I already owned, I was able to build a few cute DIY LEGO decorations for the party. 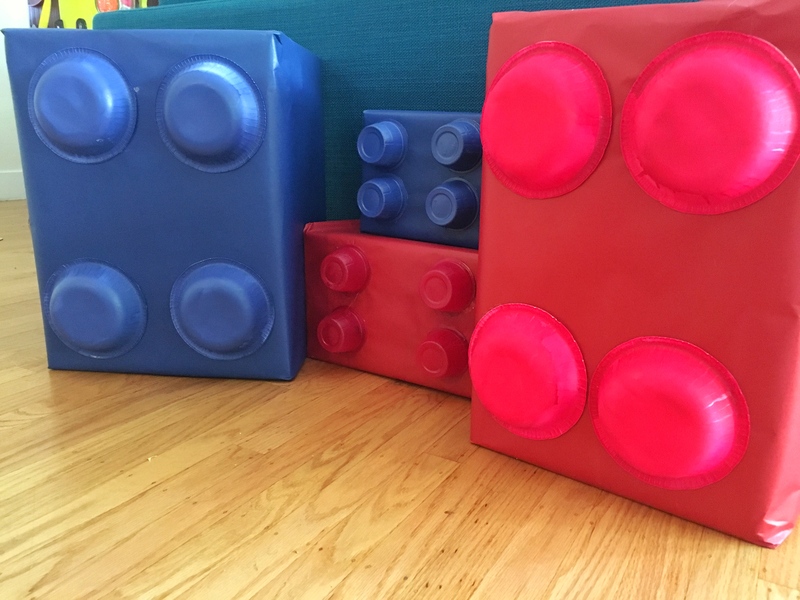 I took boxes, wrapping paper, paper bowls and empty apple sauce cups and turned them into large LEGOs. I wrapped the boxes with wrapping paper and then spray painted the bowls and apple sauce cups. 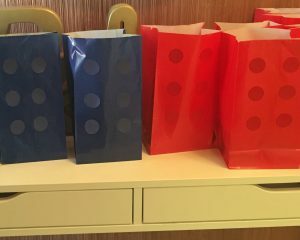 My boys favorite colors are blue and red, so I used those colors on all of my boxes. 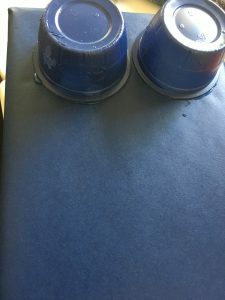 I used paper bowls on the large boxes and empty apple sauce containers on the small boxes. My boys own tons of LEGO DUPLO that I decided to use as centerpieces. 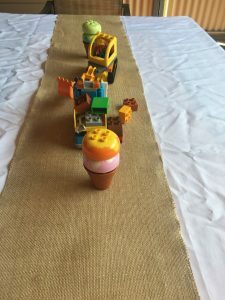 I covered the tables with a white tablecloth and put a brown burlap runner down the middle. Prior to the party my kids built LEGO sets as the centerpieces with help from my husband and sister in laws. 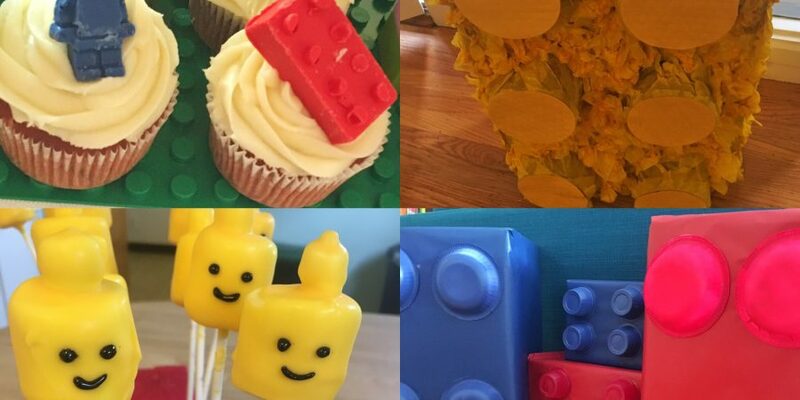 The LEGO centerpieces also kept the guests entertained during the party. The kids were building and playing with LEGOs at the table while they ate. 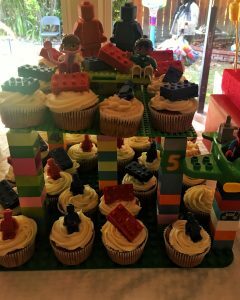 I built a cupcake tower out of LEGOs to hold the cupcakes. For the bottom of the tower, I bought an 11 inch by 11 inch green grass LEGO DUPLO piece on Amazon. 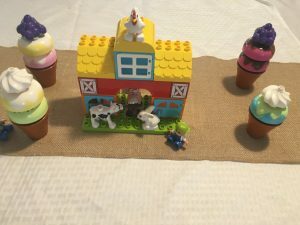 I made a 3 level tower that displayed 24 cupcakes. Also on the cupcake table, I had some red, gold, and blue balloon stars that I picked up from the Dollar Tree. I hung a banner, that I made on my CRICUT using a FREE banner template above the cupcake table. 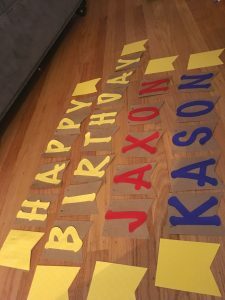 For the banner, I bought some yellow LEGO card stock at Michaels to print the words “Happy Birthday” on. 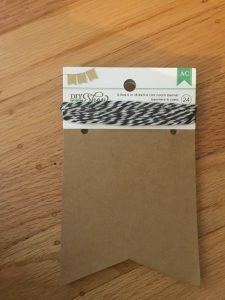 For the brown banner pieces, I purchased a “Craft banner” on Amazon that came with string to hang the banner. The piñata was one of my favorite parts of the LEGO party. The boys asked for a piñata after hitting a couple a some recent parties. I’ve never purchased a piñata. When shopping for a piñata I was surprised at how much they cost and that they do not include candy. I decided to save $30 and make my own. 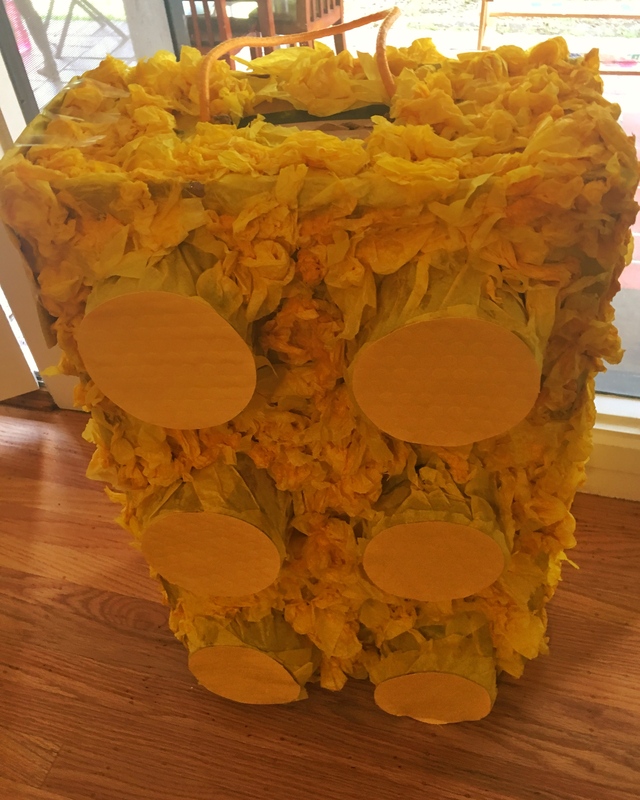 Since the piñata is just going to be destroyed by children trying to get all the candy inside of it, I didn’t see a need to invest too much money into it. The piñata was made for about $5 plus the cost of candy. 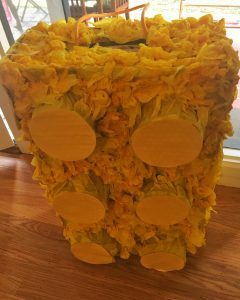 I used two Amazon boxes that I had laying around, tape, a bungee cord, glue, a hot glue gun, water, and yellow tissue paper. Making the piñata was fun and the kids were able to help me make it prior to the party. For the cupcakes, I made red velvet and banana cinnamon cupcakes topped with cream cheese frosting. 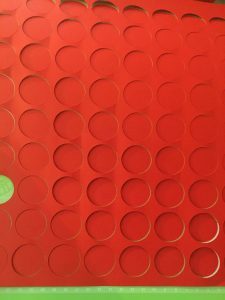 I wanted a simple design on them, so I ordered LEGO candy molds from Amazon. 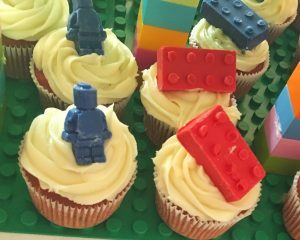 Using blue and red Candy Melts, my mother in law and I made different LEGO shaped candies to put on the cupcakes. 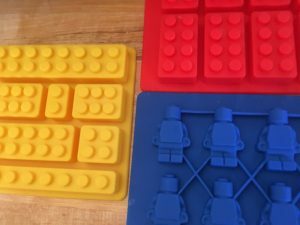 The LEGO Molds were found on Amazon and were very easy to use. 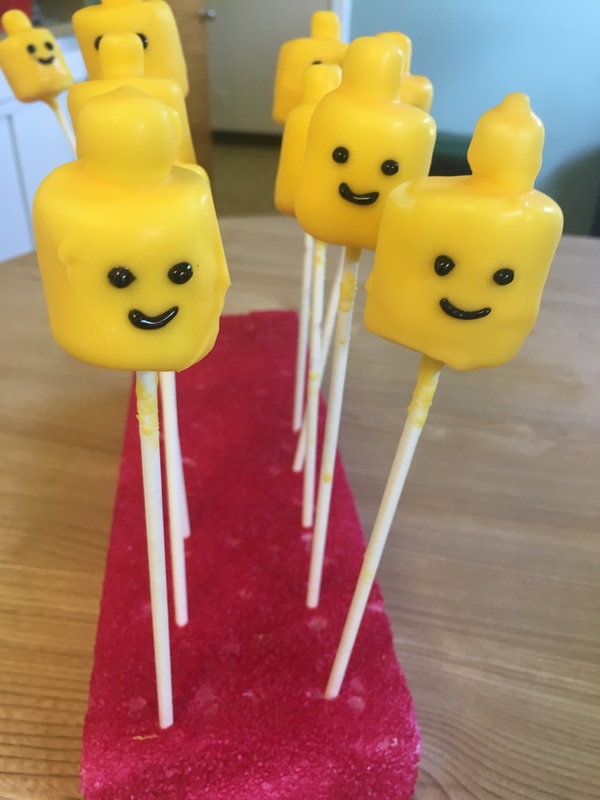 The other dessert at the LEGO party was “LEGO heads” which were marshmallows on a stick. 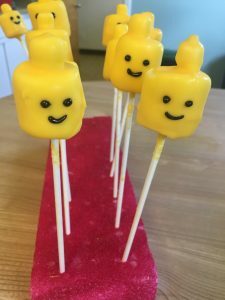 To make these we dipped marshmallows in yellow Candy Melts and drew on eyes and a mouth. 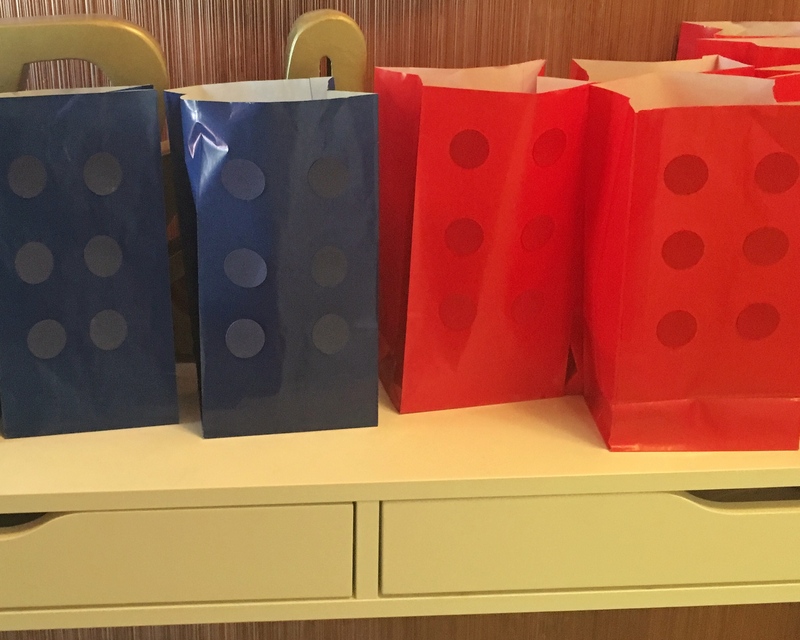 I kept the gift bags very simple, since I gave out about 15 pounds of candy! 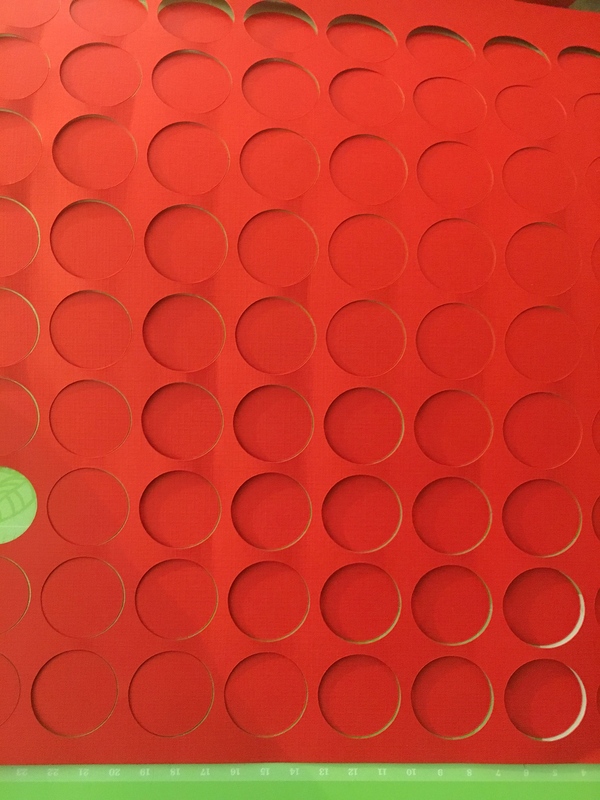 On my CRICUT I cut out 1 inch circles and glued 6 circles onto each gift bag to look like LEGOs. 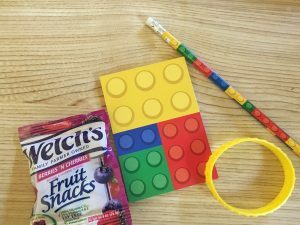 Inside the gift bag, I had a notepad, bracelet, pencil, (All bought on Amazon) and a pack of fruit snack. For the party entertainment, the kids played with LEGOs (I had a box of LEGO DUPLO for everyone to build with), blew bubbles, played in the ball pit, climbed on the jungle gym and bounced on the trampoline. See my backyard setup here. For the most part, the kids ran around and had a great time.